Is wealthy heiress Ileana de Santos all that she seems? What sinister ailment afflicts her invalid son, tended by the mysterious Dr Hayashi? And who exactly is Rosa, engaged on a secret quest to fulfill the destiny of her extinct tribe? 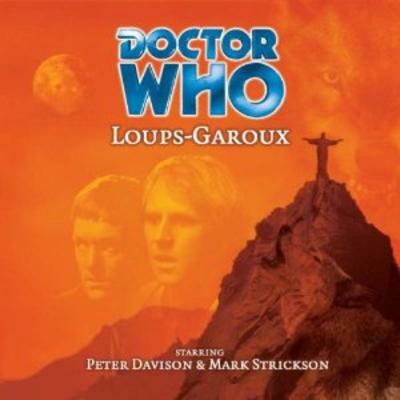 Peter Davison is the Doctor in…Loups-Garoux. Marc Platt is a name that might be familiar to Whovians, as the author of the Seven/Ace serial Ghost Light, an incredibly rich, yet incredibly confusing haunted house story. He went on to write several novels for the New Virgin Adventures as well as the highly praised audio Spare Parts. Loups-Garoux is his first script for Big Finish, utilizing a type of antagonist that Doctor Who has rarely touched upon during its run. The result is an incredibly rich serial that is much easier to follow than Ghost Light with a great supporting cast and two strong lead performances from Peter Davison and Mark Strickson that add an interesting level of characterization to a pair of characters over fifteen year old. This is the second Big Finish production for Davison and Strickson, having previously starred together in Phantasmagoria. It was the first Doctor/Companion story that Big Finish released, and as such, it felt like Big Finish was getting their feet wet; a decent story, but nothing to write home about, with flaws that were tiny, but very apparent. This one, however, is a vast improvement over Phantasmagoria, and is easily one of Five’s early best audios. Rio, 2080. The Amazon Basin has been turned into a desert thanks to over-farming and strip mining, but the city of Rio is still booming. The Doctor and Turlough have arrived for Carnival to best observe humanity in its natural state. But Pieter Stubbe, the first, oldest, and most powerful werewolf in existence, has also come to Rio. His purpose? To claim Ileana de Santos, rich cattle baroness, as his mate. Ileana and Doctor Hayashi, however, are more concerned with the safety of Ileana’s son, Victor, who is currently struggling with coming to terms with both his human side and his werewolf legacy. But when Pieter and Ileana’s pack catch a whiff of the Doctor and Turlough, and the Doctor and Turlough cross paths with the werewolves, what happens when the werewolves try to draw out Turlough’s dark side? And what happens when Ileana declares that the Doctor is her champion, and should he defend her, her future husband? Vislor Turlough, as played by Mark Strickson, was one of the few male companions that the Doctor had during his travels on television. Originally exiled to Earth due to a civil war on his home planet, Turlough was promised a chance to return home if he killed the Doctor. During this arc (known to fans as the “Black Guardian Arc”), Turlough struggled with trying to murder the Doctor, eventually turning on the Black Guardian and traveling with the Doctor. Turlough was a unique character, in that he was an an alien from another planet who absolutely found humanity revolting and stupid. After Christopher Eccleston, no one out there can spit out a line like “humans are incredibly STUPID” like Strickson. He didn’t get as much character development as he could have, thanks to traveling with the Doctor and Tegan for much of his run and departing upon the arrival of Peri towards the end of Five’s tenure. Platt’s script gives Strickson a lot to work with, and Strickson delivers with his performance in Loups-Garoux. It shows during an early scene where an exotic samba dancer approaches the Doctor and attempts to entice him to dance with her. As the Doctor tries to politely defer, Turlough is off to the side, laughing in a manner that shows just how long these two men have been traveling together. The pair are at Carnival because Turlough believes it’s where humans truly act like themselves. Most companions have either been human or very pro-human, and Turlough is refreshing in that he sees humanity’s flaws much more than their virtues. The Doctor is there to temper the rougher opinions, but he does find himself agreeing with Turlough in his own, subtle manner at times. Later in the serial, Turlough finds himself taunted by a pair of werewolves, who use their abilities to force Turlough to confront his dark side via his reflection in a mirror. Here, we see the cowardly Turlough, who instead of confronting his fears head on, runs screaming. In the hands of another actor, such a snide, cowardly character would have no place in the TARDIS. But with Strickson’s performance, the audience believes that Turlough might be a jerk who thinks he’s superior, but he’s a jerk who is TRYING. He’s not a perfect companion, but one with very deep flaws that he only confronts when backed into a corner. And in those moments, such as one in the third episode and one in the fourth episode, Turlough shows that he is capable of moments of bravery. It’s a great way to turn the idea of a companion on its head, and Strickson delivers in a way that endears him to the listener rather than make them despise the character. When the werewolves smell the Doctor, they catch the scent of ice breaking in a stream, chaos amidst the quiet stillness. The Doctor has always been one who helps people confront their nature, perhaps none more so than Peter Davison’s Doctor. Among the loud, braying voices of werewolves seeking Ileana’s favor, it’s the Doctor’s willingness to help her son Victor that draws her to him. In this serial, Platt takes on a concept that was really only touched upon once during the initial television run, all the way back during The Aztecs. While the Doctor has always been romanticized, it wasn’t until the revival that the Doctor has been seen as romantic. There’s a great scene where the Doctor runs off all his female companions, from the recently-departed Tegan all the way back to Barbara, and Turlough notices he doesn’t mention Susan, his granddaughter. Davison does a wonderful job of showing his lack of knowledge when it comes to women, which becomes a major plot point when, after providing his assistance to protect her son, Ileana declares him her champion and future mate. The Doctor goes with it, since it’s the only way to save her and protect the city of Rio from a horde of werewolves, but underneath the boldness (seriously, Davison yells out the line “I am the DOCTOR” at one point and instead of coming off as cheesy, it comes off strong and commanding) lies the confusion. Does he have feelings for her? Would he take her along as a companion if he could, and if so, would it be different than it was with Tegan, or Nyssa, or Sarah Jane? Does his age (“I’m a lot younger than I used to be”) belay his loneliness? It’s the best performance so far by Davison, and for those who might be a bit sick of Ten/Rose or Eleven/River shipping, it’s a worthwhile listen to how, at least to me, the Doctor SHOULD treat this topic. The supporting cast is large, and varied. Two of them stand out. Eleanor Bron plays the weary Ileana, an aged werewolf who doesn’t look a day over her mid-30’s. Beautiful and wealthy, with a bevy of suitors on hand, her only concern is keeping her son Victor safe. She shows concern at her son, anger at those who would harm him (there’s a great scene in the third episode where the Doctor talks her out of killing the doctor who’s been treating him), and pride when she declares the Doctor her champion. She stands up to Pieter, insisting that her Doctor will save her and Victor. Nicky Henson, as Pieter, is one of the stand-out one-shot villains that Big Finish gives us. The first werewolf, when he takes charge of the gathered pack, promising to lead them to past glories, his arrogance goes hand-in-hand with his talents. Henson plays up both his strength and his willingness to toy with his prey. He speaks with confidence, even when he’s losing. When he steps on the scene, all ears turns to him. His ultimate fate is very in line with how villains meet their end in the universe of Doctor Who. Marc Platt throws everything into his scripts. While that might lead to an organized train wreck like Ghost Light, in the case of Loups-Garoux, it’s the little touches that are mentioned. The smart bombs that will descend upon a werewolf-controlled Rio, the robotic security guard at the train station, the desolation of the Amazon, and the jaunty little jingle that accompanies a greeting card from Pieter to Ileana, all are there, but mentioned to set the background for the story instead of being shoved down the listener’s ears. Instead of flesh-ripping savages, Platt lays out a civilization of creatures who have lived on the fringes of humanity, whom they call “cut-claws,” with their own traditions and legacy without clumsy exposition. With a few car alarms, Platt lays out how Rio has been taken over by the werewolves and what the future may hold for humanity as easily as he uses the description of a parade to bring across the joy and chaos of Carnival. Aside from some microphone problems that lead to distortion in the voices of the Doctor and Ileana during the end of the second and third episodes, the sound is solid, especially the cacophony of growls and howls from the collected werewolves. 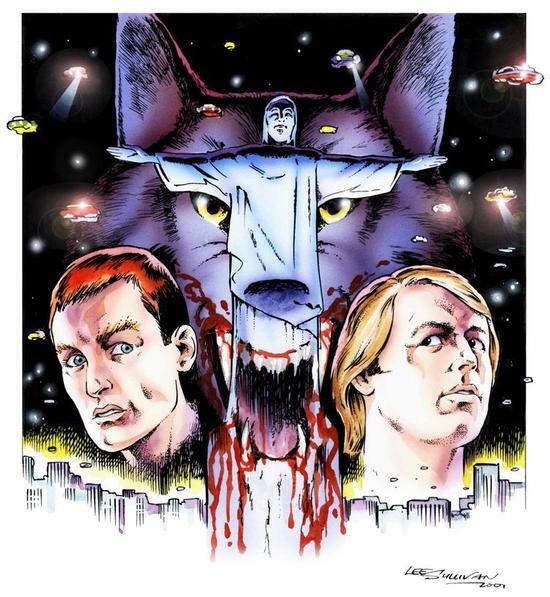 Final Synopsis – A great script by Mark Platt and killer performances by the cast turn what could have easily simply been Werewolf: The Apocalypse fan fiction into a memorable story. 4/5. Sylvester McCoy is the Doctor in…Dust Breeding. This entry was posted in Big Finish Review and tagged Big Finish, Doctor Who, Fifth Doctor, Peter Davison, TARDIS, Vislor Turlough, Werewolves. Bookmark the permalink.